AdorableFoxie.com began as a means to showcase some of my favorite things, including my original artwork and costume creations. 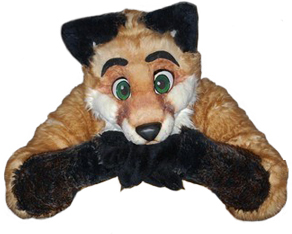 In July of 2009, Adorable Foxie because a full-time business creating tails and ears, paws, fursuit-style costumes and more. The business took off that fall around Halloween, when my small wolf tail was featured by Cookie Magazine as a part of an easy, do-it-yourself Max costume, in theme with the “Where the Wild Things Are” movie released that same year. Since then, some of my pieces have been featured on other web sites and in publications, including but not limited to use by the photographer for the American cover of Spice & Wolf Volume 2, and an interview with the Furry News Network in May 2011. Currently, I work full time crafting accessories, as well as a small amount of full costumes each year. Over the course of the next year, commissions for full costumes will be fewer, in order to focus on accessories and working the anime, sci-fi and fantasy convention circuits. Carissa St. Clair lives near Jacksonville, Florida with her husband Joe and several “fur kids” (pets). She has been drawing since she was old enough to hold a pencil, and has always had an interest in cartoons and animation. Her parents always encouraged her to use her imagination and to read. In 1996, Carissa began role-playing in a text-based Redwall game, called Redwall MUCK. It was here that she would meet her future husband! From the role-play, Carissa began drawing characters and scenes, and before she knew it, she was into cartooning as a full-time hobby. In addition to drawing, Carissa has always enjoyed performing, taking on several roles in school plays. She had a keen interest in costume design, which led to her creating various costumes of her own, including various mascots to be used to entertain during special events. Carissa has expanded her creativity to allow for her to be able to build characters – whether through costumes or artwork – for other people. She now works full-time in everything ranging from producing mascots and accessories, to managing the jewelry business started by her husband.